They're sometimes crawly and often creepy; they make up an uncomfortably large part of our bodies; and they're the theme of our latest art contest. What are these tiny wonders of evolutionary engineering? Bacteria! (In case you missed that big graphic up there or the title of this post). Why make an art contest about these little guys? Why not? It's definitely more interesting than another "Landscapes" theme, and will hopefully spark some new creative ideas. 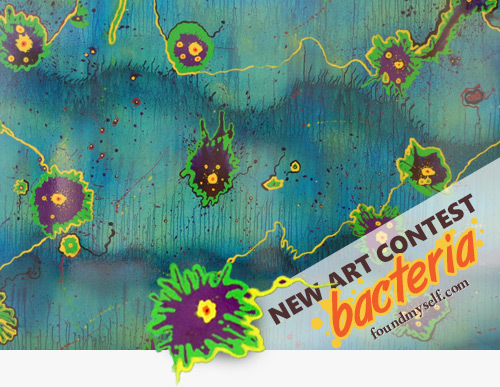 Also if you put some of the words together you get "Bacteriart," so there's that. In my spare time I've created and have been adding some designs to the new Foundmyself shop at Zazzle, so refresh it every once in a whlie to see new designs come in. By the time the contest is done there will be many more you can choose from. Also, if you have any suggestions for a design/theme you'd like to see, let me know! I thought this would be a fun way to offer prizes for some of the contests here since they're out-of-pocket anyway, and the products help promote the site a bit offline where the fleshy creatures live. What do you think? If you need some, here are some images for inspiration, but please don't use any without the author's permission. One tip: Under Search tools there's a menu item called Usage rights, and under that a setting Labeled for reuse. Not sure my style lends itself to bugs of the bacteria size. Thanx though, Harry. If you include ants, grasshoppers, and butterflies maybe. Grandaddyearl wrote: Not sure my style lends itself to bugs of the bacteria size. Thanx though, Harry. If you include ants, grasshoppers, and butterflies maybe. Where do we post or send our art pieces? ionatanws wrote: Where do we post or send our art pieces? Good question - post the art here on this thread. I'm in! Thank you for the invitation! Going to submit two ! I can't upload my picture for the contest here!